I am thrilled to once again be guest posting over at one of our favorite sites, (in)courage! 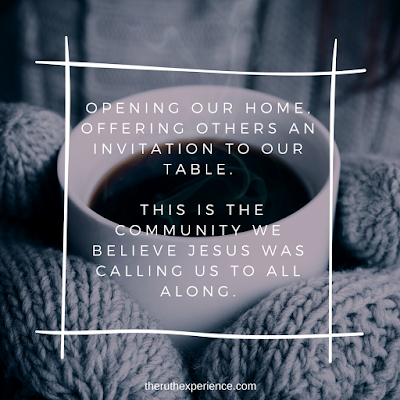 Today I'm sharing about the process my husband and I have been through this past year, inviting others into our lives and home. He comes to the door, a shy smile on his weathered face, handing me a plastic bag with a lemon meringue pie he picked up at the grocery story. I welcome him in, offering something to drink. We’ve known of our elderly neighbor for years, but only in the most casual of ways — a wave across the street, a nod of acknowledgement as we go on our way — always an event or meeting to hurry off to, no time to stop and visit. And as we sit together on this night for dinner, the first time in all the years we’ve lived here, I think back on how the past year has changed us. The verse was quoted late last spring during a Sunday morning message by our pastor. After he mentioned it, he paused. You can read the rest of the post (and enter their giveaway today!) here.